Last Updated: November 29, 2018 · Published: November 6, 2017 By: Asian Caucasian 4 Comments This post may contain affiliate links or sponsored content. Sweater weather is here! It’s also snuggle-under-your-covers weather, hibernate-for-the-winter weather, eat-lots-of-warm-comforting-food weather… well, you get the idea! We aim to please! Here’s a comforting bowl of Asian-Spiced Pork Chili that will warm your tootsies (actually head to toe) and make you scoop that second helping. Yes, it’s that good! We used so many yummy veggies in this chili, like cubed butternut squash, multi-colored bell peppers, onions and garlic, plus three kinds of beans. But it’s the spices that will have you begging for more — cumin, Chinese Five Spice, coriander, and sambal oelek (Thai red chili paste). Bet you’ve never tasted a chili like this before! Top with slices of avocado, a dollop of sour cream, and sprinkles of fresh cilantro. 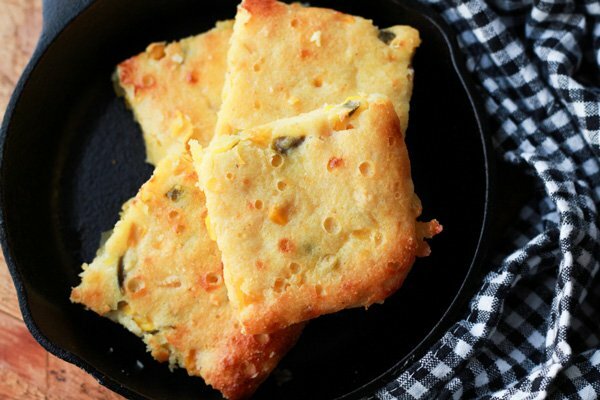 Serve with our crazy-delicious Jalapeño Corn Bread for an absolutely perfect winter meal! 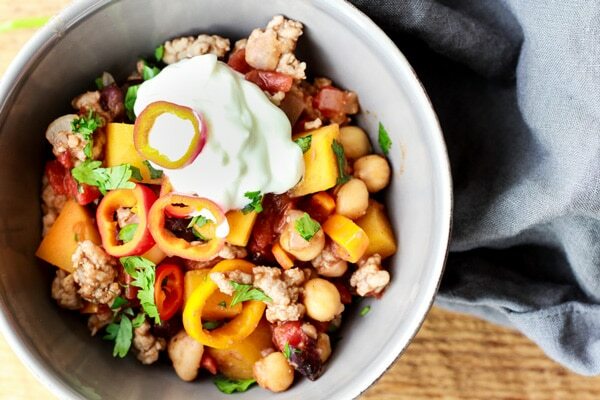 Top this heavenly bowl of Asian-Spiced Pork Chili with Butternut Squash with slices of avocado and a dollop of light sour cream. 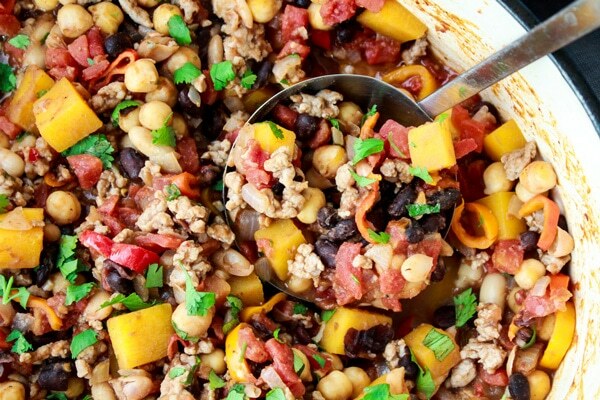 The first thing you’ll want to prepare for this awesome pork chili are the veggies. 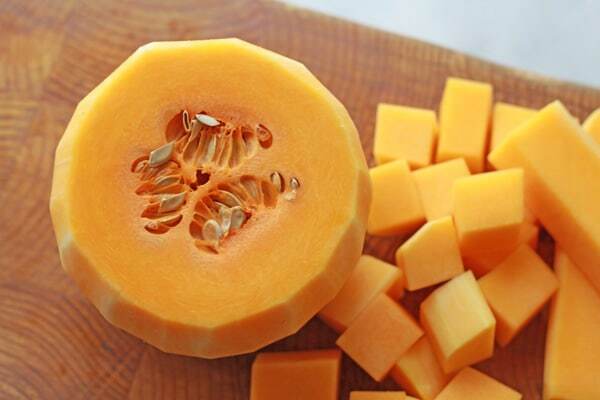 Pick out a beautiful butternut squash and carefully peel the skin off, then cut in half and remove the seeds. Then you can safely cube the squash for the chili. Buy some colorful bell peppers to slice for this chili. I used red and yellow bell peppers. Get your beans, lots of beans! I used black beans, garbanzo beans, and white cannellini beans. Don’t forget your spices! Chinese Five Spice is amazing in this recipe. I also used cumin, coriander, and a little sambal oelek for heat. Read the recipe below for detailed instructions. 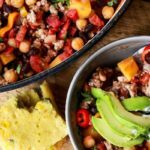 Cubed butternut squash is the perfect ingredient in this chili, along with the three types of beans and colorful bell peppers. 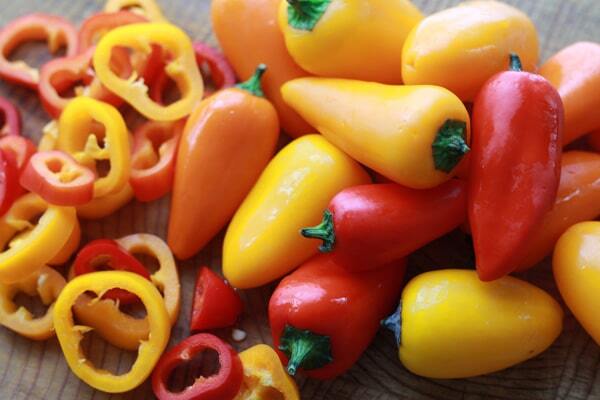 Tri-colored mini bell peppers bring so much brightness to this chili recipe. 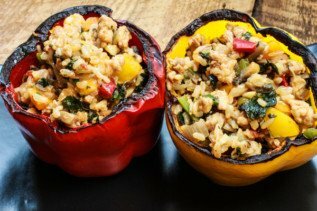 Use regular-sized bell peppers if these aren’t available. 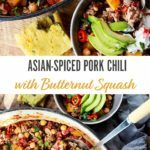 Can’t you just smell the aromas from this comforting Asian-Spiced Pork Chili with Butternut Squash? You’ll be going for seconds (maybe thirds) when you serve this dish! 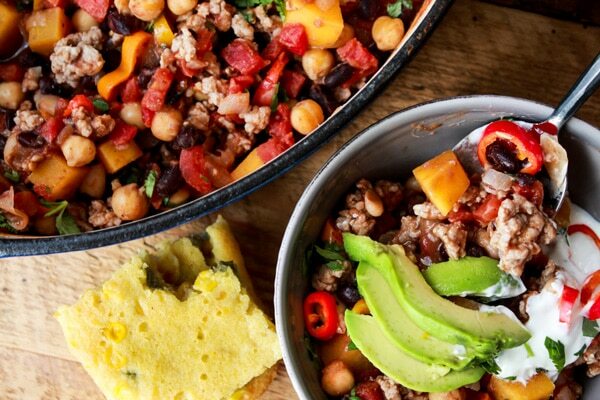 Serve this chili with a side of our tasty Jalapeño Corn Bread. It’s the bomb! 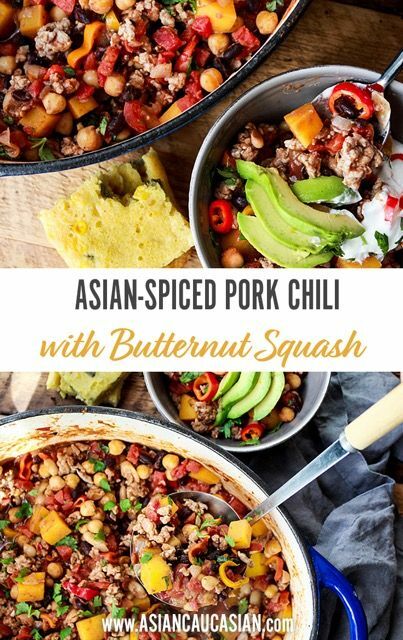 This comforting Asian-Spiced Pork Chili with Butternut Squash will have your family going for seconds and thirds of this flavorful dish! In a large Dutch oven, sauté the pork on medium-high heat until just browned, breaking pork into bits while cooking. Remove the pork and let it sit on paper towels to drain. Wipe out the pot with paper towels. Add 1 tablespoon canola oil to the pot over medium-high heat. Sauté the garlic and onions until translucent, about 2 minutes. Add in the bell peppers and butternut squash, and sauté another 5 minutes until peppers are just softened. Stir in the black beans, cannellini beans, garbanzo beans, and tomatoes and let cook for 2 minutes. Stir in the cumin, coriander, Chinese Five Spice, sambal oelek, salt, and pepper. Cover and simmer for 10 minutes. Add the pork back into the chili and stir to combine well. Let simmer another 5 minutes, uncovered. Garnish the chili with fresh cilantro, avocado slices and a dollop of sour cream. Serve with a side of our Jalapeño Corn Bread. Thank you, Jocelyn! You really should try this one. It’s really good! I can’t stop eyeing up the recommended cornbread! The corn bread is so delicious. My mother-in-law has been making this recipe for decades!